In August 2005, the Indian Parliament passed the National Rural Employment Guarantee Act (nrega). The latest avatar of state-financed employment guarantee schemes (egs) geared to alleviate rural poverty and create natural resource assets formally kicked into existence in February 2006. How will this programme fare? To answer this question, Down To Earth (dte) correspondent nidhi jamwal travelled through Maharashtra -- the first state to implement state-wide egs in 1979. Similarly, dte correspondent kirtiman awasthi travelled through Rajasthan and Madhya Pradesh to follow the fate of the erstwhile National Food For Work programme (now subsumed under the current programme). What did they find? One, egs remains a famine relief programme state governments run. Two, it has failed to create productive rural assets, and hence failed to develop The rural economy. Three, in the present scheme of things, egs cannot be successful in areas that are forestlands Four, egs has at best created mere pockets of success. Nevertheless, egs remains the most important source of livelihood and nutrition (via food grain provision) for the rural poor. It remains a most revolutionary scheme, with potential to change rural landscapes. How, then, can the current programme live up to such potential? Imampur village is in Nagar taluka of Maharashtra's Ahmednagar district, a rain shadow area. For more than two years now, the agriculture department has been implementing a watershed project here, using egs money. But when dte visited Imampur, it found out that while an entire hillock was covered with continuous contour trenches (ccts ), there was no tree plantation. Why? " egs is just one of the hundreds of schemes that we have to implement. It is difficult for us to plan, implement the scheme and then also mobilise the community," says an agriculture officer, Ahmednagar. The Imampur watershed is 740 hectares (ha) of which 503.93 ha is cultivable area, 57.37 ha forest land, 90 ha wasteland, and 88.70 ha as gaothan. It has 67 wells. Under the watershed project sanctioned under egs, work was done between 2003 and 2004; Rs 48.10 lakh were spent in making ccts and in nalla bunding work. But no plantation work. Within one year the face of our village has changed," a farmer told the dte correspondent. "Apart from just jowar and bajra , we have started growing tomatoes, gram, onion and some horticulture crops." His comment buttresses agriculture department findings: the total area sown has increased; and so have the number of wells from 42 to 67. The area under irrigation also stands at 166 ha, up from 69.50 ha (see table : More crops, more area to sow upon). Farmers here seem ready for work linked to their farms, a direct benefit, but shy away from plantation work on the ridge: there is no direct benefit. State agriculture officers agree that it is important to create a sense of ownership in the villagers because egs has no provision for maintenance of assets. "It is very important that all assets are created carefully under egs or else soon a situation may arise when the state government will exhaust all egs sites on paper, whereas not even half functional assets actually exist in the field," says Popat Pawar, sarpanch of Hiware Bazar village. With time, soil erosion is sure to choke the ccts and the earthen dams downstream. There will be no more water percolation and Imampur will be back to square one. Says an agriculture officer, "There is a need for beneficiary management. For instance, after watershed work water table in the village rises but if there is no water management, then the situation will return to zero within couple of years. Watershed work should not lead to more and more withdrawal of groundwater without its getting replenished. Community development and watershed development have to go hand in hand." When all the government officers understand this logic, why are they unable to implement it at the field level? Ahmednagar district has a registered labour strength of 270,552 in its 14 talukas and spends between Rs 30-40 crore per annum on egs works (this goes up to Rs 100 crore during extreme drought years). The state government claims that it has done the best egs here, but travel showed success limited to a few pockets. egs is yet to cover the entire district. Why? "At present there is no coordination between, say, the agriculture department and minor irrigation," says Anna Hazare of Ralegan Siddhi. "Whereas the former will make earthen dams and do compartment bunding, the latter will not make percolation tank to complement that work. And neither will the forest department do plantation at its forest land on the ridge. Hence what you see is individual structures. They look good in isolation but do not make any sense when seen together." Data compiled by the district administration for the last seven years shows good progress so far as village internal roads, and soil and water conservation work are concerned. But percolation tanks and afforestation is way below the mark. 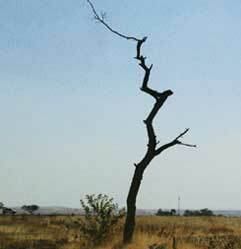 Which is why, although most valley work is today complete in Ahmednagar, its hillocks are still barren. Travel across Melghat, and discussions with forest officials and local Korku tribals will confirm the deepest fears: egs cannot succeed wherever there are huge tracts of forest land, tracts where also some of the country's poorest people live. "Melghat is spread in Dharni and Chikaldara taluka s of Amravati district, Maharashtra, with a total area of about 4,000 sq km out of which almost 3,000 sq km is forest land. There are only 100 villages within the protected forest area (the Melghat Tiger Reserve) whereas another 300 are outside the forest areas. The total population of these two talukas is about 2 lakh, of which almost one third is labour force. This means at any given point in time 45,000 people need to be employed. And even if we follow nrega (the current programme) and provide employment for only 100 days in a year, the cost comes to Rs 22.5 crore per annum for Melghat alone," says R K Wankhade, deputy conservator of forests, Melghat Tiger Reserve. As per district administration figures, almost 246,621 labourers have already registered themselves for egs work across Amravati, out of which 45,777 are from Chikaldara and Dharni taluka alone. But why is almost one-third of Melghat without any source of livelihood? In early February this year, a large group of tribals from Melghat organised a padayatra and walked from Paratwada to Amravati to meet the district collector, Ravindra Jhadav, and demand work under egs . All had a common complaint -- their agricultural land is disputed and they rarely get work under egs . Says Bhai Ranu Jamunka, a 75-year-old farmer from Keli village in Chikaldara taluka, "Out of 600 people in my village, only 18 own land and the rest work as labourers. Even the land of these 18 is under dispute... I am tilling my land for the last many decades but now the forest department says it is their land. What am I to do? In any case, in forests there is no source of income, no irrigation facility, nothing." It is the same story for Sabulal from Biba village in Chikaldara taluka, "Forest department has recently cut a plot in my land and says it belongs to them. I do not have 7/12 (record of rights) to prove my ownership over the land." On being questioned about availability of egs work, Sabulal said it takes one to two years to get that work. Vithal, a 45-year-old villager from Bodhu village in Melghat has a different problem. "My village is in the interiors of Melghat and till date has not been electrified. We have small patches of land on which we do agriculture. Since there are no irrigation facilities, every year villagers make a temporary dam on a rivulet and divert some water to our fields. But the forest department says this is illegal. Every year we have this fight with the forest department... As far as egs is concerned, it can at best provide us with 15 days to a month of work in a year. Do you think we can survive only on that? We mostly migrate to cities in search for work." Tribals also complain it takes months before they receive egs payments. A major problem with carrying out egs works in forest areas is the requisite '60:40 ratio' of unskilled to skilled labour. Most of the structures cannot be constructed because they do not fit into the cost norms of the state government. Secondly, Melghat is thickly forested: there are no big open spaces to do egs work such as continuous contour trenching, and no sites for plantations. Forest officials claim they are made to sound like villains when all they try to do is follow the rules. Says an executive engineer at the egs department, Amravati, "No other department is allowed to work on forest land. And neither can they take up work and leave it unfinished because of a patch of forest land that happens to fall in between. But rather than lambasting the department, which is only following the Forest Conservation Act ,1980, we should think of ways by which egs can contribute positively in forest areas. Forests no doubt have become a curse for Vidarbha's people because in the name of conservation, they remain underdeveloped." A look at the district-wise data in the same time period shows that maximum egs money has been spent in Solapur district (Rs 586.86 crore), followed by Beed (Rs 506.12 crore) and Ahmednagar (Rs 504.99 crore). Based on the official data, dte has ranked top 10 egs expenditure districts in Maharashtra and looked at the nature of work that has been carried out in these districts (see chart : Top 10 districts in Maharashtra on the basis of their EGS expenditure). All these districts either fall in rain shadow area or have high tribal population in dire need of egs works. In all the districts over 50 per cent of egs works are water conservation and agriculture. In case of Solapur they are as high as 75 per cent of the all egs works. Least egs expenditure in the last three decades is in Raigad district at Rs 11.62 crore, followed by Washim at Rs 15.04 crore and Hingoli at Rs 18.30 crore. EGS work is not evenly spread across the state. Says R C Kanade, former principal secretary, egs, Maharashtra, " egs work depends on a number of factors, such as availability of alternate work, labour presence, rainfall, poverty, people's attitude, dependence on agriculture, etc. For instance, in a district that has more scope for agriculture work, very few labourers report on egs work because they get higher wages on agriculture work sites." Rainfall seems to be one of the most important factors in deciding the extent and spread of egs work in a district. Konkan region districts like Raigad, Ratnagiri and Sindhudurg receive heavy rainfall, hence report very low egs. Thane is part of Mumbai agglomeration and reports low egs except in tribal dominated tehsils of Jawahar and Mokhada. If women's participation is used as a proxy for raising the nutritional status of households members, egs seems to have reduced intrahousehold inequalities in nutrition, notes Dev. Notes a January 2003 paper, Is there a case for the employment guarantee scheme in India? authored by Raghav Gaiha, "In some of the poorer regions (eg tribal villages) the egs continues to confer significant transfer and stabilisation benefits during long seasonal slacks. As alternative employment options are few and far between, the dependence on the egs is unavoidably high for those who are able to participate in it. If the overall participation rates are low, it is partly a consequence of the nature of projects undertaken and low outlays and not so much a result of slackening of demand for the egs. A case therefore is made for enhanced outlays under the egs with a substantially higher reallocation in favour of the poorest regions." Says A Gadilkar, deputy collector (egs), Ahmednagar, " egs has definitely increased seasonal irrigation in this rain shadow district. Earlier we could hardly get one rabi sorgum crop but now we also take other seasonal crops like onion and vegetables. Apart from this, almost 69,000 ha area in the district is at present under horticulture crops only due to the egs sub-scheme. Earlier during extreme drought almost 680 water tankers were pressed into service in the district, but these have now reduced to mere 18 tankers." As against 34.55 per cent families in Maharashtra below the poverty line (bpl), Ahmednagar has only 25.04 per cent bpl families. Infant mortality rate is 47 as against 74 for Maharashtra. Various official studies, however, show the fruitlessness of egs works. The Maharashtra government undertook a study in 1982 to understand benefits accruing out of 19 percolation tanks constructed under egs in six districts and the results showed that something was clearly amiss. The study found that out of the 222 wells that were to benefit from the 10 percolation tanks, only 190 wells were in operation in the command area. And out of these 190, just 101 wells reported an increase in water levels. Hence, the actual benefit in terms of increase of water in wells in command areas worked out to be less than 45 per cent. Further, details about wells in Bhandara district were not available. In Yavatmal, not even a single well had benefited and in Ahmednagar, potential utilisation was less than 25 per cent. Similarly, an evaluation of six minor irrigation projects -- four in Bhandara, one in Aurangabad and one in Yavatmal -- shows that of the 289 ha of irrigation potential that these projects had to create, only 188 ha (65 per cent) could be achieved. Road projects under egs fare no better. Evaluation of 24 road projects confirmed that two works in Thane and Aurangabad were not usable and destroyed; three roads were not in good condition and deteriorating for want of maintenance; but the rest 19 were in good condition and being used. egs has failed to make any noticeable impact on Maharashtra's tribal districts, infamous for high child mortality due to malnutrition. Between 1.20 lakh and 1.75 lakh children die every year for medical reasons and that another 38 lakh would die in the next 20 years. Lives of another 8 lakh are at present threatened due to grade 3 and 4 malnutrition. Experts agree that most of Maharashtra's tribal population depends on EGS for livelihood, but it has made very little impact in raising their living standards. The concept of creating employment in public works is not new for the rest of the country, because the Maharashtra model of rural employment has existed since the 1970s. The most critical difference now is that people's entitlement, by law, to employment, is now mandated through nrega for the entire country, which it earlier was only in Maharashtra. Not much has changed in the form and substance of the public work programmes in the past 20-odd years, however. Only names have. The first set of programmes, the National Rural Employment Programme and the Rural Landless Employment Programme, began in the 1970s as clones of the Maharashtra egs. In 1989, the schemes were revamped by the Rajiv Gandhi government, which took the bold step of integrating the two schemes into one, and decided delivery would occur through the panchayati raj institutions (village-level elected institutions). This was a heady period of development experimentation in the country. The programme was renamed, for political correctness, the Jawahar Rozgar Yojana (jry); but it was radically different. The bureaucratic machinery was bypassed; funds would be deposited in the accounts of each village institution responsible for planning development activities used to create employment creation, and overseeing implementation. The scheme began but it was never given a chance to succeed. In retrospect, jry was perhaps an idea before its time. In 1990, when prime minister V P Singh ambushed the Rajiv Gandhi government over the Bofors gun scandal, the election call was a promise to 'guarantee' Maharashtra-type employment for all. Instead the subsequent, Narasimha Rao-led, government diluted what existed. By 1993, jry received little political leadership or attention. It was agreed (from largely anecdotal and some official reports) that the scheme, controlled by people's representatives, was leading to increased corruption and even greater inefficiency in delivery. Therefore, it needed to be re-vamped. In 1993, the Employment Assurance Scheme (eas) was launched. Now, half the allocated funds for rural employment would be channelised through the bureaucracy, not the panchayati raj institutions. The big brother was back in business, to the tune of roughly Rs 2,000 crore each year. In April 2002 another re-naming took place. This time the two schemes -- jry and eas -- were merged to create the Sampoorna Grameen Rozgar Yogana (sgry). Its spending, too, was divided between the panchayati raj institutions and the administration. Incidentally, in the National Democratic Alliance period the name of jry had been changed into the Jawahar Gram Samridhi Yogana (jgsy). A component of sgry provided foodgrain to calamity-stricken states for relief work. Now the cost increased to about Rs 4,000 crore per year. Then came the semi-final reincarnation. In late 2004, the National Food for Work Programme (nfwp)was launched, targeting 150 backward districts. These districts were identified through a task force set up by the ministry of rural development, which used three variables to compute 'backwardness' -- agricultural productivity per worker, agricultural wage rate and the scheduled caste and schedule tribe population in the district. This programme was to be implemented through the district administration and a menu of "labour-intensive projects" would be prepared, to be undertaken over a five-year period. In the 2005-06 budget, the allocation was enhanced. nfwp got Rs 6,000 crore in addition to the sgry's Rs 4,000 crore. The final change came in December 2004, when the National Rural Employment Guarantee Bill was tabled in Parliament. The bill provided a guarantee of 100 days of unskilled manual work in a financial year to every poor household, in rural areas, whose adult members volunteered for work. The first phase would cover 150 districts. But many believed the bill 'diluted' what the common minimum programme of the government had promised. The bill was referred to a parliamentary standing Committee, which gave its report after two and a half sessions, called the legislation as "path-breaking" but observed that organisations and individuals who deposed before it were "almost unanimous" in objecting to several provisions. Contentious issues in the bill involved restricting the programme to bpl, or below poverty line, families; a restrictive definition of what constituted a "family"; provisions enabling government to "switch off" the guarantee at its discretion; and, most critically, the failure to give panchayati raj institutions a central role in implementation. In August 2005, the Union Cabinet cleared amendments in the National Rural Employment Guarantee Bill, 2004. Now 100 days work was guaranteed to all (not just below poverty line households); it was extended to 200 districts (not 150 backward ones) and half the scheme was to be implemented through the panchayati raj institutions, much like its predecessor. The game is now afoot. In the 2006-2007 Union budget the government has allocated Rs11,300 crore for the scheme. But before spending rush begins, dte has taken note of two districts under nfwp, to learn recent lessons in doing development through labour: drought stricken Dungarpur in Rajasthan and Jhabua in Madhya Pradesh. Click here to Only JRY was truly radical (pdf format). The programme planners of employment programmes -- call it Sampoorna or Guarantee -- measure their success only by the number of days of employment created. Their objective is to distribute wages for work, to avert famine: commendable, but limited. Each year, the same district spends on drought mitigation, building assets that are not maintained. egs is relegated to drought relief, not relief against drought. It does little for development. It does little for poverty reduction. This when its potential is enormous: using the labour of the poor to regenerate the rural ecosystem. The problem is that because planners are obsessed by employment creation, they are obsessed by corruption in the creation of employment. Most research on employment programmes has focused on the lack of transparency and accountability in schemes. According to researchers Dev and Robert E Evenson, the cost of transferring one rupee under the erstwhile jry was Rs 2.28 in the mid-1990s. They compared it to Rs 1.85, the cost of transferring Re 1 under the Maharashtra egs. These researchers found that in the different employment schemes, the routine use of contractors, fudging of employment rolls and violation of norms lead to huge costs in delivery and extreme inefficiency. They estimated that in the three states of West Bengal, Haryana and Gujarat, the cost of generating one day's employment was Rs 200 to Rs 300, far in excess of the wage rates given to the poor households. In addition, government's own evaluation shows that only Rs 15 of every Rs 100 reached the beneficiaries. Leakages were enormous and crippling. This has meant an obsession -- perhaps rightly so -- on reducing leakages by increasing the power of people to check muster rolls and scrutinise the wage records. "Corruption is not unexpected when money is involved and the transaction is between officials, who have the power and control over the money, and the poor unemployed labourers who have little choice," says Atanu Dey, a developmental economist. In the current National Rural Employment Guarantee Scheme the effort is to improve decision making through the use of the Right to Information Act, which gives local communities rights to check wage records. There are also plans for social audits and financial checks to plug the holes. The problem is that even with all this done, a water structures remain a hole in the ground because the catchment has not been treated. A tree remains a hole in the ground because the saplings have not been protected. A road remains what it was -- a collection of holes in the ground -- because it has not been built to last. It has been built to be washed away. Each season, so that employment can be guaranteed. The fact is that the history of employment creation programmes in India is not new. But researchers and planners have never bothered to evaluate what has worked, why and how. The last institutional innovation was made in the early 1990s, when funds and responsibility were transferred to locally elected bodies. Since then the programme has spent Rs 2,000 crore annually in the early 1990s, to Rs 4,000 crore annually in the early 2000 and now Rs 11,300 crore under the National Rural Guarantee Scheme. The fact is that nobody knows where this money has been spent; on what programmes, in which village and if the assets created have been maintained or not. The current programme is built on the developmental imperatives of the different districts. But it does little to address the key institutional and management gaps that exist in programmes of soil, water and forest conservation. These are fragile assets. These assets require management and maintenance. dte reporters have found that even with some basic investment, the returns can be enormous. One good water harvesting structure built pre-monsoon can lead to enough soil moisture to grow a supplementary crop. Many soil and water conservation programmes can transform village economies. There are instances where this has happened. But these instances are too far and too few between. The problem is that we have not learnt to create institutions by people, that can deliver for people. In the entire work on rural employment, while governments glibly talk of the role of the panchayats, little has been done to build institutional capacities so that these agencies can function. There is little expertise and little use of perspective plans so that developmental imperatives can become employment objectives.